You are impeccably dressed, well researched and rehearsed, on time and waiting in reception before you are called in to interview. You know what to do. This isn’t your first time. But still, you’re nervous. You want to make a great first impression. And, right there, your nerves have caught you in their butterfly spin. We’ve got some insider tips showing exactly what goes into making a great first impression to focus your thoughts the next time you are waiting in reception. It’s a scientific fact that human beings make decisions about strangers in the blink of an eye. Literally. We spend the next three seconds completing our opinion, around our perception of personality and competence. Once that decision has been made it is nigh on impossible to change it. The psychological advantage of making a strong first impression is significant; if you later make a mistake, you are most likely given the benefit of the doubt. There’s not a lot we can do to change these facts. We are funny creatures. This is where you can make a difference. Consider that the bulk of our communication is non-verbal. While it’s important to prepare what we would like to say, our body language is far more influential than the words we choose. Make sure your gestures and body movements are congruent with what you are saying. For example: don’t describe a challenging situation where you had to fire an employee while smiling. While you might smile out of nerves or a desire to please your interviewer, the strong message you send is confused. Likewise the classic example of avoiding eye contact. It’s considered a negative gesture. You might feel intimidated, which is reasonable at a job interview, however what you are communicating is weakness. Keep your body language open and relaxed. Communicate that you’re prepared and ready for the interview: you want to engage. Your tone of voice is another powerful influence. One way to settle your tone is to take a few deep breaths, making sure you breathe right into your stomach. A classic mistake is keeping the breath in the chest area which means your shoulders are hunched up and your breath trapped. Breathe deeply and your register will drop from its nervous higher pitch, down to its natural tone. Your tone of voice delivers your message – make sure it’s in your voice. Remember there are two factors at play here: the words you use and the way in which your message is received. Focus on your delivery. Be kind and courteous to everyone. Think about how difficult it is to interpret someone’s behaviour and message when they are distracted. 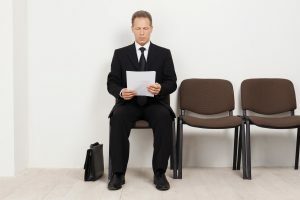 Any good interviewer will ask the receptionist, security guard and anyone you may meet on the way to interview what their first impression of you was. Make a conscious decision to switch on the moment you leave home. Give your nervous energy something to do. Enthusiasm generates confidence. Allow yourself to be enthusiastic, confident and happy. Allow? Yes. Nerves have a sneaky way of imprisoning us in slightly robotic behaviour. Be authentic, enthusiastic, humble and kind. Allow yourself to shine.